The Journey Church - Boca Raton - What Does it Mean to Be a Christian? Are you ready to make a fresh start with God? Whether you want to put your faith in Jesus for the very first time or renew your commitment to him, it’s never too late. God loves you and wants to give you a fresh start. The only way to find forgiveness from God and to begin a relationship with Him is to trust in Jesus’ sacrifice for you and repent—turn from your sins. We urge you to take this step of faith today. To do that, simply talk to God—this is called praying—and tell Him you believe in His Son. If you prayed the prayer above, please complete the form below to let us know and receive your Fresh Start Packet. Now that you have made a decision to follow Jesus, it's time to be baptized. Baptism is an important symbol of your new life in Christ. It is the first step of obedience that every new Christian takes after coming to Christ. And, it is an experience that you will never forget as you follow in the footsteps ofbillions of Christians before you who have been baptized. To sign up for our next Baptism, to learn more about baptism, and to watch a recent baptism video, go to www.bocajourney.com/baptism. Or reply to this email and I’ll add your name to the baptism list today. 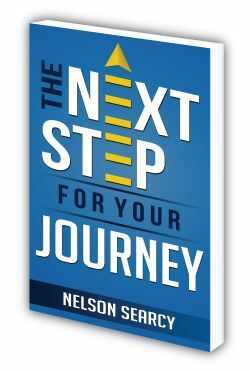 To help you take the next steps in your new relationship with Christ, our Founding Pastor, Nelson Searcy, has written a book just for: The Next Steps for Your Journey. You can download this free e-book by clicking the button below. The Journey is a casual, contemporary, Christian church in South Palm Beach County. 2200 NW Boca Raton Blvd.